Free Shipping Included! 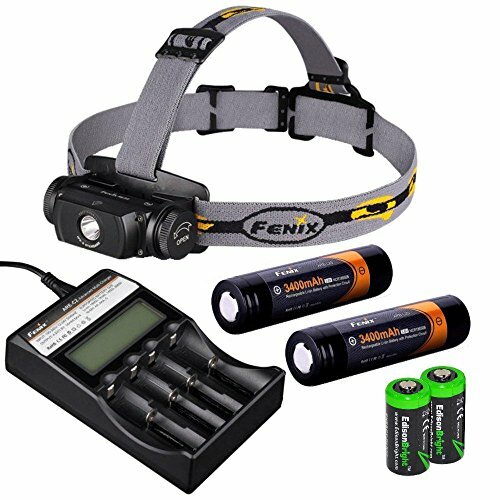 Fenix HL55 900 Lumen CREE XM-L2 T6 LED Headlamp with Fenix ARE-C2 four bays advanced digital battery charger, 2 X Fenix 18650 ARB-L2S 3400 mAh rechargeable batteries and two EdisonBright CR123A Lithium batteries by Fenix at Mountain Walk. MPN: HL55-AREC2. Hurry! Limited time offer. Offer valid only while supplies last. The Fenix HL55 headlamp offers four brightness levels plus 900-lumen burst mode and 150-hour runtime from one 18650 battery or two CR123A batteries. The Fenix HL55 headlamp offers four brightness levels plus 900-lumen burst mode and 150-hour runtime from one 18650 battery or two CR123A batteries. Neutral white light means superior definition and penetration in high-humidity environments. - 4 X EdisonBright CR123A Lithium batteries.